A classic Martini cocktail is turned into an amazing party dish with a little kick. Check out my Dirty Martini Cheese Ball with Blue Cheese Stuffed Olives! So this recipe isn’t really a cocktail but a dip inspired by a cocktail. You are getting two for the price of one and the price is free! 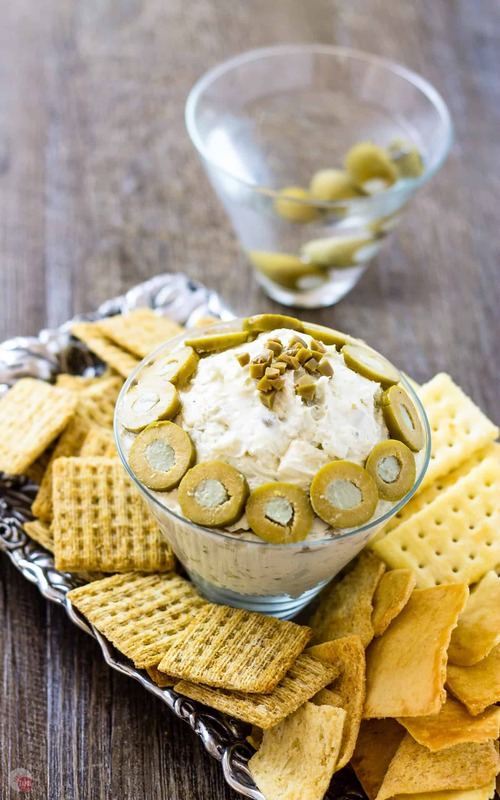 Check out a spin on a dirty martini with my Dirty Martini Cheese Ball. The perfect way to start your weekend and eat some crackers while you are at it. I have filled it with blue cheese stuffed olives for an extra kick! Last year I made my first cheese ball for the blog, not my first ever cheese ball in life but the first cheese ball recipe on Take Two Tapas. I teamed up with Old El Paso to make a Mexican Cheese Ball with Spicy Tortilla Chips and it was, and still is, a hit for tailgating. I recently started thinking of new cheese ball recipes as they are so great for entertaining. I highlighted a few of the great things about cheese balls when I posted my Wasabi Ginger Cheese Ball recipe recently. Easy to make ahead, the flavors get stronger as they sit, and they make great gifts, are just a few of the reasons to make cheese balls but I have to tell you this latest recipe is going to make you fall in love if you are not already. A martini is a classic cocktail of gin, or vodka, and dry vermouth. I prefer mine with vodka as gin is very herbaceous, but I also prefer my martinis with vodka because I like mine extra dirty. In case you are not a martini drinker, a dirty martini is made with olive juice and served with an olive garnish. Extra dirty just means an extra amount of olive juice in your drink. My hubby, on the other hand, prefers his martinis with blue cheese stuffed olives. While coming up with cheese ball recipes, and indulging in adult beverages, I decided to mix our two cocktails and make them into one cheese ball. A Dirty Martini Cheese Ball with Blue Cheese Stuffed Olives. My dirty martini cheese ball is perfect for all your upcoming holiday parties, especially ones where they are serving cocktails! 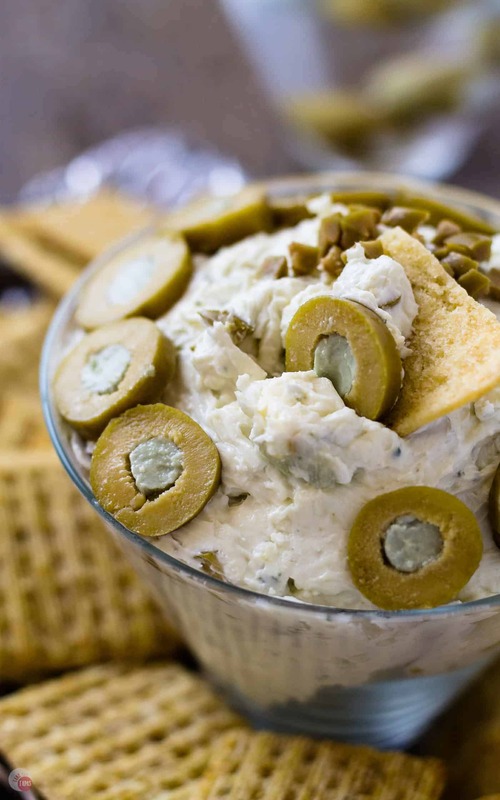 The combination of cream cheese, the obvious base for a cheese ball, blue cheese, and lots of chopped olives will make everyone happy. Because it is a dirty martini cheese ball we can not forget the “adult” part. 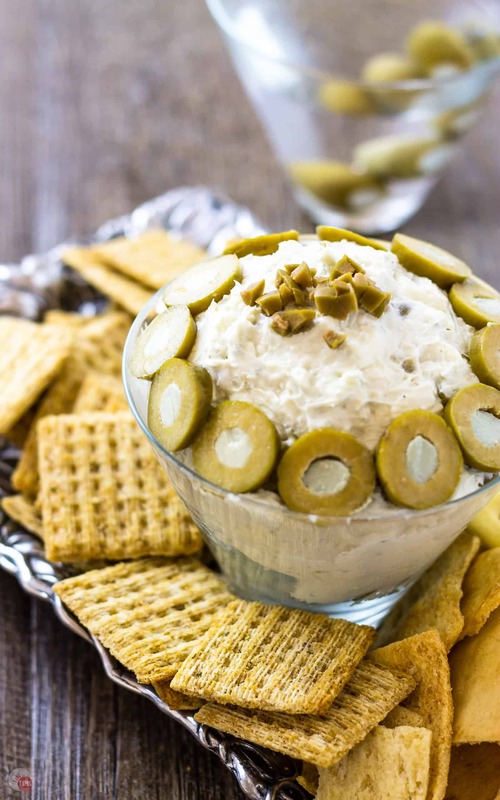 Vodka, dry vermouth, and lots of olive juice make this a true dirty martini cheese ball. 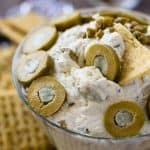 The blue cheese olives I used for this recipe are available at your local grocery store in the olive and pickle section. I am lucky enough to have a store with an olive bar and they are always stocked with lots of blue cheese stuffed olives. I didn’t have an olive bar when we lived in Waycross and now that I have one I am getting items from it each time I go. I grabbed 12 large blue cheese stuffed olives for this recipe. 8 for chopping and mixing in the dirty martini cheese ball and the other 4 I use as a garnish by slicing them and putting them around the edge of the cheese ball. You can vary how many you want to add to the cheese ball and how many you want to use as a garnish. The bonus using the blue cheese stuffed olives is you get even more blue cheese in the cheese ball! I serve my Dirty Martini Cheese Ball in stemless martini glasses which I bought for serving ceviche at a supper club dinner I hosted. 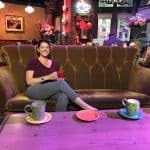 An added bonus is that I can use them to serve cocktails which is their ACTUAL purpose! I like to drink out of them because they are stemless and being a total clutz I prefer not having a top-heavy cocktail glass to knock or tip over. Do you like your martini shaken, stirred, dirty, extra dirty, or classic? A classic Dirty Martini is turned into an amazing party dish with a little kick. Check out my Dirty Martini Cheese Ball with Blue Cheese Stuffed Olives! With a hand mixer or stand mixer, cream together the blue cheese and the cream cheese. Add the vodka, dry vermouth, and olive juice. Chop 6 of the large blue cheese olives into small pieces. Mix in the chopped olives by hand. Form into a ball and wrap in plastic wrap. Chill in the fridge for 30 minutes to set. When ready to serve the dirty martini cheese ball, remove from the refrigerator and place in a martini glass. Slice the remaining 6 blue cheese stuffed olives and arrange around the bottom of the cheese ball or all over it. You can garnish with a sprinkle of chopped olives on top. Serve with an assortment of crackers or vegetables. If you make this the day ahead the flavors will intensify as it sits. 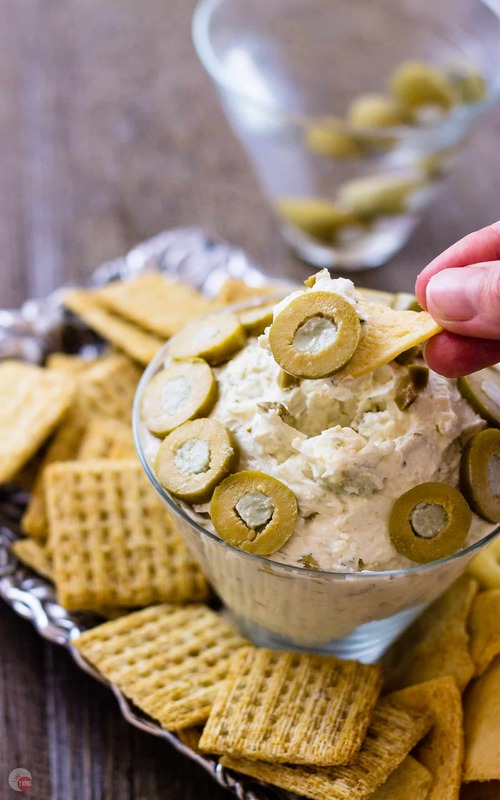 This is a runny dip, NOT a cheeseball. The recipe is not complicated….and tasty, but there’s no way this can be made into a ball. I’m sorry it turned out runny for you. Did you let it set up in the fridge for a little bit? If it is still too runny, feel free to reduce the amount of vodka in the recipe and see if that helps. This sounds delicious! Will make for my next party!